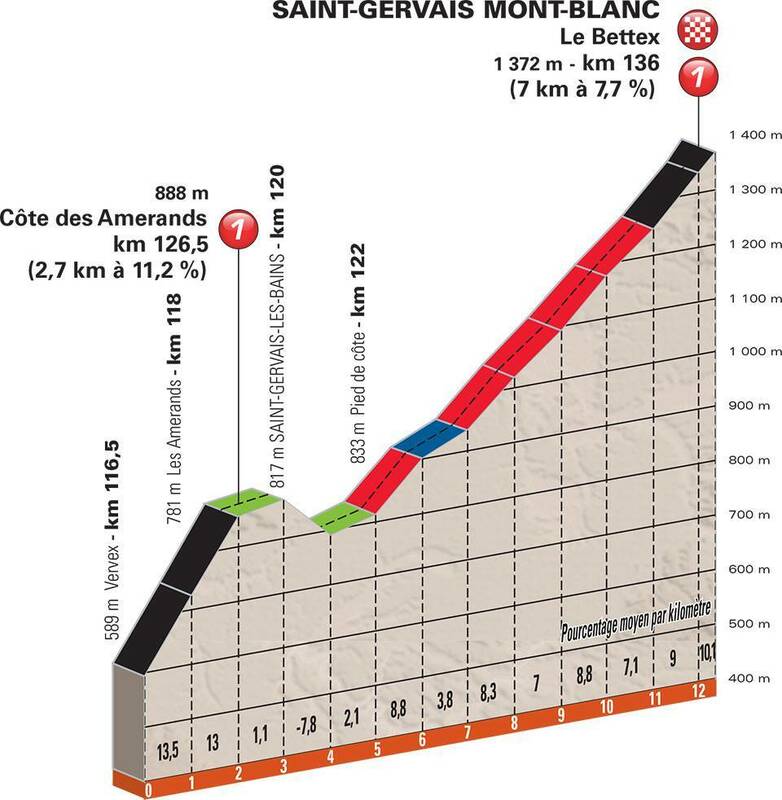 The final stage and the hardest finish with the climb to Le Bettex via Les Amerands. Remember the early finish time if you plan to watch on TV. Force Basque: a stage win for Pello Bilbao, sixth overall in the Giro two weeks ago. He went on the attack on the first climb within a large group with team mate Dario Cataldo hunting for points in the mountains competition and kept going. They say in French that riding a grand tour is worth “one more tooth” meaning you come out that much stronger, able to turn a bigger gear and Bilbao was a visual demonstration of this. On the final slopes of the Petit Saint Bernard he looked like he was taking part in one of those Basque strongman competitions, his legs turning slowly and forcefully but it was effective, he held of the chase off Dan Martin, Romain Bardet, Geraint Thomas and Adam Yates who’d all jumped away from what was left of the peloton after Team Sky and Ag2r La Mondiale shredded the pack on the preceding climbs. Thomas jumped away late in large part because he could and it’ll be interesting to see if he can repeat this today, on a sustained and steeper finish. The Route: 129km starting with a ride up the Tarentaise valley to climb the Cormet de Roselend in the reverse direction to yesterday, 19km at 5.9% but with a difficult middle section of 7-8% – the part that Romain Bardet tried to exploit on the descent yesterday – before a brief descent and then a hard slog to the top of 6-7%. It’s followed by descent with a break as the road curves around the Roselend lake before a steep drop towards Beaufort. The Col des Saisies is climbed via a back road that starts above Beaufort, an irregular and badly surfaced section that’s a third category climb in the roadbook if it’s not on the profile above, then the more traditional ascent of the Saisies via Hautluce, a very steady climb of 6-7% most of the way. 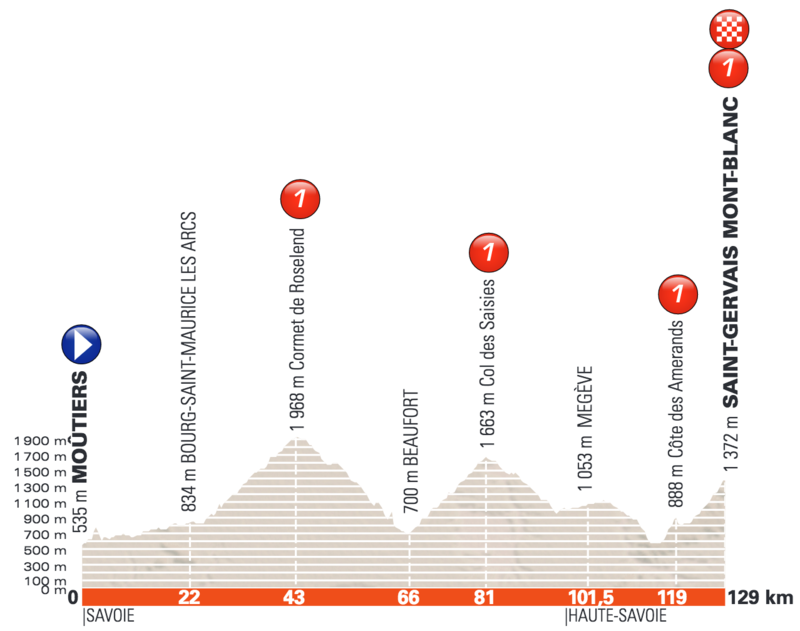 The descent then picks up the route of Stage 19 from the 2016 Tour de France via the Saisies descent (which includes a brief climb) and then the valley road to Megève which is hard going for a small group as it’s wide and exposed. The comes the Domancy descent – where Romain Bardet attacked in 2016 and Chris Froome crashed – before a brief valley road to the foot of the final climb. The Finish: like the 2015 Dauphiné and 2016 Tour they take a short cut up the mountain via the hamlet of Les Amerands and there’s almost 3km at 12% and the hardest thing is the irregularity of the road, it rears up, levels out then it kicks up again, a tarmac version of a bucking bronco with sharp corners and 15% sections. Once the steep part is over they join a bigger road with some fast sections where the road rises right to the line. The Contenders: Romain Bardet, Geraint Thomas or Dan Martin? These three have emerged as the best climbers in the race so who to pick? Probably Martin as he’s looked energetic and isn’t a threat on GC to Thomas but he’ll have to jump late rather than early or risk Romain Bardet worrying about his podium position… unless Martin fancies getting on the podium to make it three years in a row on the steps. Bardet is looking strong and returns to familiar roads but just seems short of that form he showed last July and Thomas is looking very comfortable but this finish is much steeper so it should be more of a test. Otherwise Adam Yates is close too. Can a breakaway make it? Yes because the course is well-suited to a move going clear, the climbs suit diesel-style riders and so familiar names like Dario Cataldo, Thomas de Gendt, Dylan Teuns and others can try the early move again. Weather: sunshine and clouds with the chance of showers at altitude, 22°C in the valleys. TV: the final 90 minutes are live on air and finish is forecast for 2.55pm CEST. I don’t think Bardet is looking strong at all. This is not the strongest field. Dan Martin is an also ran in grand tour GC terms, Thomas is a man with no grand tour GC top tens (as his critics remind us), Adam Yates is still building form after a crash earlier in the year. Bardet has lost time to Thomas on all three of the MTFs in this race so far and has not once put the Welshman in danger. I don’t say this means Thomas is better than Bardet. I say it means Bardet is short of where he has been before. Some will see in this a matter of timing his peak in form. Its an argument to consider. But I hold to my view that a guy with Tour ambitions and, as yet, no World Tour stage race wins, should be aiming to win this race and, up to this point, Bardet has been way short of that. You might say he’s only using the race for training. No, I’m not buying. Look at Nibali, that’s what he’s doing. Its not what Bardet is doing. Bardet is just coming up short. Those expecting him to suddenly find the top step in Paris should prepare for a (foreseeable) disappointment. As to Thomas, bar a crash that probably removed a stage win he’s had a very competent race, albeit that, as previously mentioned, its not the strongest field. Yet you can only beat who is there and he has so far done that seemingly with something to spare. Talks of “co-leadership” with a 6-time grand tour winner are probably delusions of grandeur but if he gets the luck Thomas can be a consistent performer and should easily sit alongside those he’s been riding with here in Yates, Martin and Bardet. Like Porte, it would be good to find out for once what 3 weeks of form from Thomas actually looks like. As someone with a full trophy cabinet (not from cycling, though), I am a lot prouder of my 10th place trophy on a World Championship round than any of the wins on lesser internationals. But would you concede that outsiders to your sport might ask you what/if you’d won anything? Bardet, Martin and Yates are doing fine. Their core strength is there, and they’re proven three week performers. They’re missing some top end power / finishing speed, and that can be worked on in the remaining weeks. There’s really not much to extrapolate other than that. The time trialling was and remains a challenge for the Tour. However, I see Movistar as the joker in the Tour pack. They could have a strong TTT and be within seconds of Sky in that. They also potentially have the firepower to rip apart the mountains if – and it’s a big if – their top trio ride for each other. If they do, and I feel that they should really sock it to Froome, the Tour could blow apart and this can advantage the likes of Bardet, Yates and Martin too. RonDe – I’m close to adding you to Anonymous and his family in the “scroll past” comment category. I think we all understand you dislike Bardet and unless you plan to become the DS of AG2R and lecture Mr. Bardet on what is and what is not important, perhaps you should give this a rest? Take it easy Larry. Come the Tour I’ll be asking when Nibali has ever been a serious threat to Froome and won’t mention Bardet at all. Promise. And, crucially, I’ll always give reasons which people are free to counter with actual arguments. PS I don’t “dislike” Bardet. I question his credentials. If RonDe agrees to give Bardet a rest will you also agree to give “Heinie’s folly” a rest as well? People in glass houses really shouldn’t throw stones. I have to 2nd you on this, Larry. Also would like to point out even Froome’s string of one week stage race wins in 2013 were more motivated by inner team competition against Wiggins. Not saying the races are not prestigious, but proving to Sky that he can do it and thus able to get full support probably plays a more important part in his decision in terms of what sorts results he is aiming for in these races. In the subsequent years, these races became more a form check for him. Or as happened a few times in 2014/15, ways to gain physiological edge over AC. Porte did the same in 2015, but after proving his credentials to Sky with the one week race wins, he couldn’t deliver the Giro. All in all, one week wins and GT podium/top 10s are very different type of beasts. Deciding which one is more prestigious is often a very subjective matter since no one gives a dam about WT points sans Velverde. Bardet’s lack of one week race results may simply be a result of him being the undisputed Tour leader at AG2R. As for his legacy, he wins plenty of spectacular stages both in GTs and week long stage races. Even if this is not more prestigious than winning those stage races by being consistent (but win no stage at all), it’s certainly more visible. So I wouldn’t worry too much and change my focus if I were him. RonDe I think your assassination of Bardet’s credentials is going too far, as it lacks perspective. I think it is fairly clear that Nibali and Bardet are looking to the Tour, while Thomas and Martin are riding for the win. The difference is really that sprint in the last 500m which both Thomas and Martin have repeatedly unleashed. If Bardet podiums and maybe snatches a win in the process of warming up to the TdF it’s all good. I think what is interesting is how both professionals and fans view the race alike. It seems to have dropped in the esteem of both to some extent in recent years, though I’m actually enjoying watching Martin and Thomas slug it out. The parcours have been excellent and a well thought out race it has been. Dude, give your Bardet trolling a break. And us. If my points are incorrect REFUTE THEM as many others have reasonably chosen to do. “Trolling” is doing as you have done which is offered ZERO. Why do people always seem to feel they need to mention that Thomas is a ‘Welshman’? TGH seems to be putting himself in the frame for Tour selection but will probably still just miss out. Maybe he could make a quick switch to Fortuneo – they’re in need of a decent climber, or indeed a half-decent climber. I do love that Gwent play on words and used it myself yesterday. The man himself probably wouldn’t be impressed however; it might be akin to calling a Geordie a Mackem or such like. There’s definitely historical rugby rivalry between the two areas and no doubt plenty of other stuff too. Team Sky beat Mitchelton Scott by about 60 seconds in the team time trial here and AG2R by about 90, while Thomas and Yates clocked the exact same time in the prologue with Bardet only 2 seconds adrift. Meanwhile over at the Tour de Suisse the Sky’s B team lost a minute to BMC in the TTT. To state the obvious, for any team with GC ambitions at the Tour de France, it will be imperative to turn up with not only some guys who are strong against the clock but also that can work as a cohesive whole. In other words you can’t just lob a rider like Stijn Vandenbergh in with a bunch of skinny 60kg climbers and not expect to lose fistfuls of time. While it may rankle some, TTTs matter and make for exciting racing. Calling it the Sky “B Team” is being generous. Procyclingstats say its 13% of their possible team strength. In the Tour I expect BMC and Sky to argue over the win. The likes of AG2R and Bahrain will still be 90 seconds back. So your general point is sound in that riders without a strong cohesive unit around them are actually entering the Tour already down on GC. Hah, well spotted (and I didn’t want to be accused of Sky-bashing). Yes, as we’ve been discussing all week, some riders and teams seem to de-prioiritise time trials but only to their detriment. Do they though. I’ve ran the risk of sounding like AG2R’s fan clubs secretary this week, so I’ll use FDJ as an example as well. They’re obviously a French team and have a moderate budget. Their main source of riders is from French feeder clubs and they probably can’t persuade their sponsor to fork out the cash for say the time trial champion of Spain seen as he’s not in their market (if that’s the right term) and they have enough of a job on their hands affording the wages of their top French stars. Who should they sign? They’ve tried their best to improve what the have time trial wise after perhaps neglecting it for a while, but without the wedge to buy a few top time trialist ir the culture that produces them they’re a bit stuck. The Australians particularly, and British, have been good at converting top track riders to the road and TT. Are there any French examples? They are Groupama – FDJ now, and that comes with a different budget. Even French teams change. The time trial champion of Spain rides for Sky incidentally. Jonathan Castroviejo. But taking on Richard’s argument I have to say I find it a bit lacking. Spanish teams tend to favour Spanish riders and Italians take Italians. Belgians and Dutch teams take Belgians and Dutch riders. Does France have a lack of sponsors that these other countries don’t have? Does France lack big companies who could be sponsors? Does France simply lack decent riders?In recent years Quick Step, what is now Mitchelton Scott, BMC and Sky have all been good at the TTT. The world champions at the moment are not a mega bucks team but Sunweb. There is certainly a case to answer that the French have largely dropped the time trial ball… to their collective detriment. Exactly Team Sky can identify that there is a TTT in the Tour next year and go out and sign the time trial champion of Spain. That was my whole point. Can the French teams afford to do that as well as keep the star riders their teams are built around? Probably not. On a restricted budget AG2R have done pretty well getting Gallopin, Vandenbergh and Naesen. And they do have the time trial champion of France, and Gougeard who’s a rouleur. They aren’t as weedy as they used to be. They aren’t a classics team, not many can afford to be both strong flat landers and target grand tours. Is anyone going to criticise Quick Step for smashing the TTT but not having a GC rider to benefit from it?! What was the Sunweb point? They have Tom Dumoulin who is ITT world champion and tows the rest round. I’m pretty sure that’s not how a TTT works Richard S. The Sunweb point is they are a team comparable to FDJ or AG2R yet they are TTT world champs and have won a grand tour. 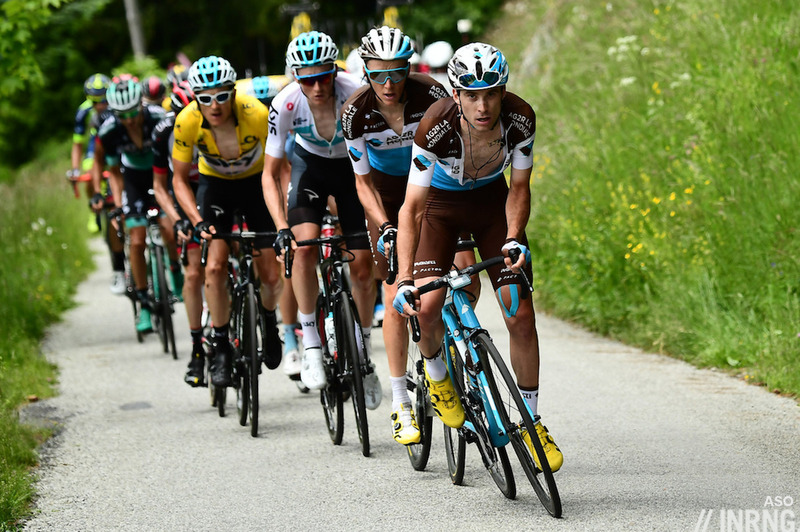 Your excuses for the French teams don’t wash.
AG2R did precisely that in the Tour de Suisse. Finished over a minute behind BMC. Geraint Thomas has been impressive so far in this race, out climbing all his main competitors. No reason to think he will not go on to win the overall. The acceleration away yesterday was striking, the only “but” being that he didnt decisively drop the others. This was not Chris Froome on the Finestre, I got the impression that if the race had gone on they might have got back though maybe G could have gone again. I think both Romain Bardet and Dan Martin came to the race with designs on winning it rather than just as a warm up for the main event. Not sure about Adam Yates, he seems to be able to come in near the front without any signs of actually winning, maybe he is saving it all for today. I agree with the comments about Tao GH, his climbing has been impressive and he seems to be a good addition to a TTT squad too. I suppose the only question is whether he can last for three weeks. Sky are likely to have a mighty strong team in July, arguably stronger than in the past. I have a feeling that if the GC gap had been smaller then Bardet and Martin would have been a bit quicker to take up the chase when G accelerated. Sure, he gained a few extra seconds but at what cost today? Smart riding to let him go. There’s a reason I’ll be taking three weeks in July away from these pages. With contributions as valuable as this you shan’t be missed. Is it because you’re Romain Bardet? Me too, and I am a different anon! Hey, Romain, you know you can access this page on your phone as well. Whilst 4G signal can be tricky in the mountains sometimes, try get wi-fi from your hotel. Get your DS here as well, I’m sure the tactical insight can be helpful. Just don’t get dishearten by RonDe though. All in all, he’s a good chap. Looks like we have confirmation! It was Thomas all along using this race as prep for the Tour. That is what it means when you are dropped on a summit finish, right? Good (brilliant?) ride by Tao GH. Job done for GT, don’t think he will be too bothered about the stage. Heartbreaking to see poor old Navarro pipped in the dying meters by Yates. Interesting seeing the result without the TTT. Thomas still wins but close. Yates +4secs, Martin +7secs, Bardet +18secs. And that’s with Thomas crashing in the ITT Gastro George. No point stripping out TTT either, as it was part of the race – just as it will be in the Tour.